The record-breaking 2018 Al Mouj Muscat Marathon was hailed a huge success as thousands of runners filled the streets of Al Mouj from the early hours on Friday morning. A large international contingent of athletes welcomed the near perfect conditions, which saw many runners achieve personal best performances. The centrepiece Al Mouj Muscat Marathon event was won by Kenya’s Moses Too who completed the 42km course in 02:19:30, ahead of Anouar El Ghouz with another Kenyan, Gideon Kipgurui Kipsang, third. And for eight-time marathon runner Manal Rostom the Al Mouj Muscat Marathon marked a new personal best performance. The high-profile Egyptian runner and mountaineer has been the figurehead of a global Nike-made athletes’ hijab campaign. “I just love how the (Oman) culture is evolving and the way they are introducing kids, expats or locals everyone, to exercise more – today it was a perfect course with perfect scenery, and ideal for getting a personal best, so I am super-happy,” said the Dubai-based pharmacist and personal trainer. The Half-marathon event attracted a record 684 entries. Jordan’s Mohammad Alkhwaldeh won the men’s race in a time of 01:14:01 ahead of Omani runners Hilal Al Golandni and Mahmood Al Quraini. Meanwhile, British athlete Sarah Steer was frustrated in her attempt to reclaim her Guinness World Record for the fastest half-marathon pushing a double buggy when a wheel on the buggy holding her twin three-year-old sons Luke and Nathan failed 2kms into the race. In the 10km event victory in the women’s race went to Muscat resident and physiotherapist Dawn Meredith-Davies. “It was a bit of a mad dash out to the front at the beginning but then I kept it steady – you have to have a target and I just kept going at that, though I had a great race with the woman who came second,” said Meredith-Davies, who runs with the Muscat Road Runners, founders of the Muscat Marathon in 2012. The men’s 10km was won by Omani runner Abdullah Al-Quraini in a time of 00:33:55, ahead of Ahmed Al-Amri and Omar Al-Hmrashdi. Meanwhile, the 5km Charity Fun Run in support of The Oman Diabetes Association saw 1099 runners taking part and was won by Muscat’s Amjad Alshkaili, with Kate McDonald the fastest woman. Also taking part was Belgian runner Edwige Van Den Assem, who at 73 was the oldest athlete competing in the Al Mouj Muscat Marathon festival of running. “I may be the oldest runner here but I don’t feel it – running makes me feel 10 years younger, gives me a lot of social contacts and I aim to keep on doing it. I like running because it keeps me healthy and I am a very active woman,” said Edwige, who only took up running when she retired 10 years ago. The prize-giving was held following racing with guest of honour His Highness Sayed Mohammed bin Salim bin Ali Al Said, ambassador and chief of Protocol, Ministry of Foreign Affairs of the Sultanate. David Graham, CEO of event organiser Oman Sail, said: “Great congratulations are due to all the runners who competed in – and completed – this year’s Al Mouj Muscat Marathon festival of running. “We were especially thrilled with the diversity of nationalities taking part and the enormous interest that we’ve seen from people of all ages and ability to participate in what is now a truly international event. The seventh edition of the Muscat Marathon saw a record-breaking number of 6094 entries across all race categories with runners from 87 countries including India, Britain, the Philippines, France, South Africa and the US. 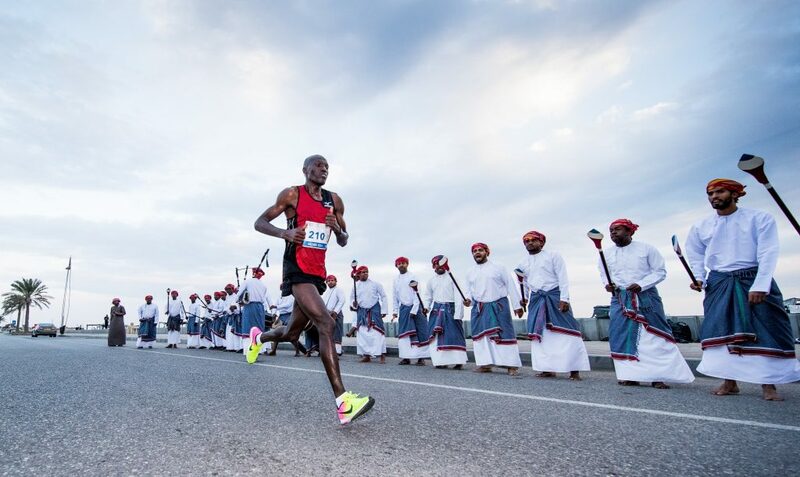 In the run-up to the festival world running’s international governing body AIMS – the Association of International Marathons and Distance Races – formally recognised the Al Mouj Muscat Marathon for the first time. Organised by Oman Sail, the Oman Athletic Association (OAA) and the Muscat Road Runners, and with the active support of title sponsor Al Mouj Muscat, official partners Carrefour, BP, Aquafina and Topfruit, and official suppliers Omantel, The Wellness Centre and DB Schenker, the event has gone from strength to strength to become the highlight of the Oman sporting calendar. Yesterday, an extraordinary 2374 children – aged from seven to 12 years-old – took part in the Kids’ Run. Dozens of schools took part, with the Al Seeb International School winning the Most Active School in Oman trophy and 1000 OMR in gym equipment.